Missing teeth can cause many uncomfortable moments in our lives. However, thanks to the development of dental medicine there are excellent solutions to restore chewing ability and to eat, drink and smile without any limitations. Dental implantation or otherwise called insertion of artificial roots is a surgical procedure with a minimum of risk and it is practically painless. 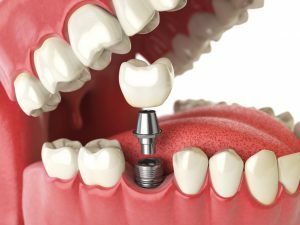 During this process instead of the missing teeth an artificial tooth root is implanted. Due to the world-wide dissemination of implantation systems the prices of implants have become more affordable, that is why everybody can find the perfect implant system. The KG Dental Clinic is the reference surgery practice of the ADIN implant family, which provides maximum guarantee regarding qualitative and durable implantation. For which dental problems does implantation provide a permanent and aesthetic solution? If the neighbouring teeth are healthy, so you have only lost one single tooth (for example after a sport injury or the tooth has broken due to an accident or caries was so extended that the tooth had to be extracted), by implanting, the grinding of the neighbouring, healthy teeth can be avoided, and instead of a bridge the missing tooth can be replaced by a single implant and a crown. In these cases the integrity of the neighbouring teeth can be preserved as well, because the missing teeth are replaced by implants and crowns or bridges. This is a gentle and long-lasting solution for correction of missing teeth. For a long time there was only one solution for the state of complete toothlessness: removable dentures. But if wearing of removable denture is uncomfortable for you or it isn’t stable enough, with the insertion of a corresponding number of implants, even dental crowns or bridges can be prepared. Furthermore the fixation of instable dentures can also be achieved by the use of implants. With this solution the juvenile chewing ability can be restored and one can courageously smile again. How are artificial tooth roots, dental implants inserted at the KG Dental clinic? In our clinic it is possible to make computerized treatment planning and guided implant placement. Safe and precise treatment with the least possible inconvenience! Guidelines for aftercare of your mouth, in order to preserve the health and stability of implants. Swelling can be reduced with the use of ice packs, wrapped into a towel, so put this on the area of implantation. Don’t eat until the local anaesthetic hasn’t completely worn off. During healing period you shouldn’t drink coffee, tea, alcohol, or eat highly seasoned or hot dishes. You are advised not to smoke for at least one day (of course the best solution would be to refrain from smoking, as this is the most serious threat to implants). Don’t drive within one hour after the implantation operation. If you have been given a course of antibiotics to take after the surgery, please ensure to take these according to the instructions of your dentist (if necessary analgesics, painkillers). Don’t consume dairy products for one week. Oral hygiene should be given great attention, dental floss should be used. In the days after the operation mouth rinse with Chlorhexidine or Listerine is recommended. 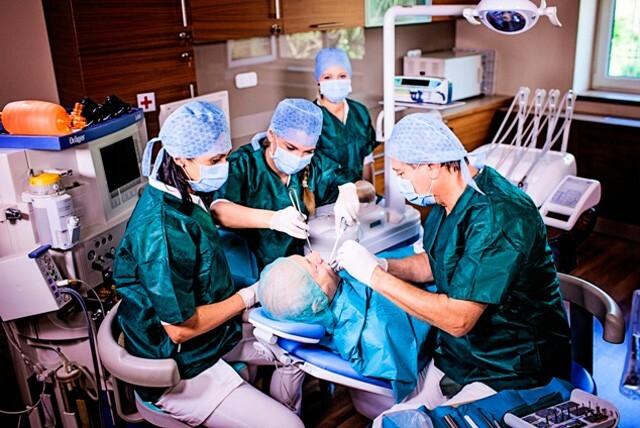 It is important to know that after the preparation of the implant-supported dentures the contact between the dentist and the patient hasn’t ended. In order to achieve long-term results, the dentist’s instructions must be followed precisely. Regular dental check-ups are essential, about every 6-12 months and oral-hygiene should be taken care of. Your dentist or a dental hygienist will provide help and will show you proper dental care methods. If needed special tools should be used beside the toothbrush (interdental brush, dental floss etc.). The long-term success of your implant-supported denture also depends on the cooperation with your dentist. In case of even small irregularities you should contact your dentist immediately. Why can you feel sure, after the preparation of your implant-supported denture at the KG Dental Clinic? We rely on the quality of ADIN implants inserted by our clinic to such an extent, that we provide a lifelong guarantee on them. For the implant-supported denture we provide a guarantee of 3 years. What to do in order to have your missing teeth replaced by top-quality implants with a lifelong guarantee? The insertion of implants are a decision for life, which you can only make with appropriate awareness when you know all important information. 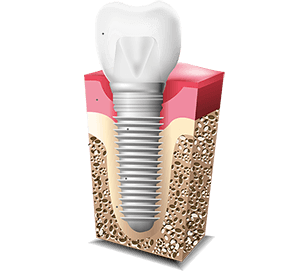 A dental implant is an artificial root. It is a special screw, which is inserted into the jaw bone to hold the replacement tooth and to replace the root. Which parts do implant-supported dentures consist of? The implant screw (fixture), which replaces the root in the bone. 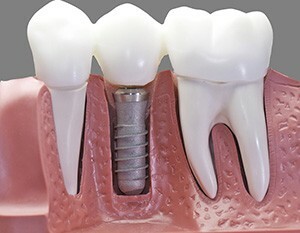 The abutment, which connects the crown and the implant screw; the crown, which replaces the lost tooth. Implants are made of ultrapure titanium alloy (TriGrade5), which is allergy free and is able to grown into the bone. Everyone, who has a good general health condition and oral hygiene, and has enough jawbone quantity and quality. The affected area should be healthy, free from any inflammation. Implantations can be carried out after the completion of bone growth, at every stage of life. In which cases are implants used? In case of restoration of one single tooth: in this way the healthy neighbouring teeth can remain intact instead of being prepared for bridge crowns. Open-end situation: restoration of chewing function in cases of molar loss, where bridge restoration in not possible, only removable dentures could be prepared. But by the insertion of one or more implants a fixed bridge can be prepared. 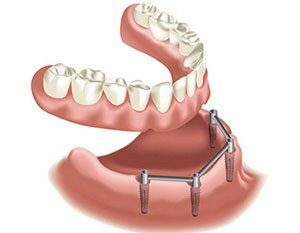 Toothless jaw: By the insertion of 6-8 implants a fixed denture can be prepared for a complete toothless jaw, or with the help of 2-4 implants a fixed denture with hidden anchorage is also possible. How soon after an extraction should an implant be placed? The healing of the extraction point and the tissue takes about 3 months. After this healing period the implant can be placed in the place of the lost tooth. How long one must wait for the preparation of the denture after implantation? 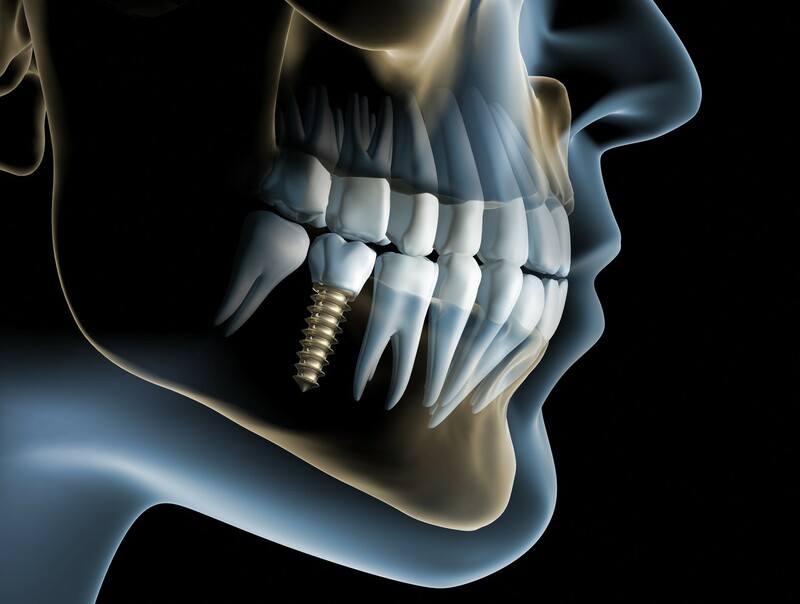 The implant has an appropriate stability for the applied load, when the surrounded bone tissue is strong enough and the implant has coalesced with the bone. This time period takes 3 months in case of the lower jaw (mandible), 4 months in case of upper jaw (maxilla) and 6 months in case of bone replacement. We are looking forward to welcome you in our dental office. Our reference clinic for implantation has been visited by several hundred patients for implantation for decades. The gained experience will provide you help as well, to come to an appropriate and safe decision.